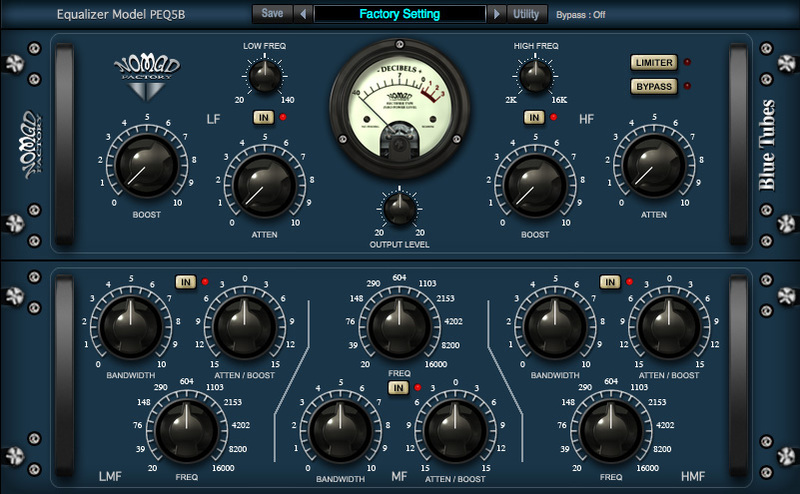 The Blue Tubes Equallizers Pack is a collection of six, vintage-style EQ plug-ins that include everything you need to dial in your frequency tweaks. Featuring an assortment of everything from graphic EQ's to parametric EQ's, the sound quality of Blue Tubes is nothing short of amazing. Yet all six plug-ins provide a simple and functional “vintage-style” interface, as well as very low CPU consumption for lightening-fast processing. The Blue Tubes Equalizers Pack has been totally redesigned in order to offer even more great features enhancing your digital sound recordings. The BT Equalizer BQ2S is a simple and elegant 3-band “British-Style” equalizer. The BT Equalizer BQ2S is equipped with high and low frequency shelving curves and a Parametric Mid-Band covering 300Hz-5kHz range. The BT Equalizer BQ2S is ideal for both tracking and mixing applications. The output stage includes a simple peak-limiter or 'Brick-Wall' circuit.